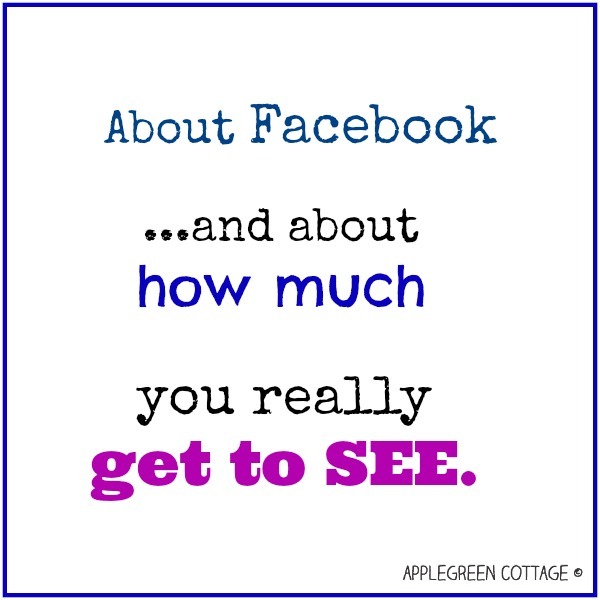 Facebook - How much do you REALLY get to see? In short, even if you liked my page and I post regularly for you, you get to see less and less of AppleGreen Cottage's posts on your Facebook. This means you may not receive my content anymore via the Facebook page because it simply doesn’t make sense for me to pay Facebook to send you free tutorials and tips I prepare for you, as I am doing that as a hobby. But I'm still sure that smart and useful DIY ideas need to circulate (otherwise, what's the point of them? ), so I intend to keep up the work. Just not as much through Facebook. But YOU WILL STILL FIND EVERYTHING ON MY BLOG, just like until now. It's really unfortunate how Facebook changes it algorithm often. It started as a platform to connect people, and now it seems like their premise has gone by the wayside. Since the beginning of this year I have not really been posting on there very much - I was doing some paid promotion posts and did not see much more traffic or likes from it. I think that facebook also distracts a lot of my time I could-should spend on other things so that is another reason I have been limiting my time on there the past few months. I also think that people follow-like so much stuff on there it is hard to keep up with all of it or for facebook to put it in your feed, probably. For the most part I have ditched Facebook as a platform for my blog. When your "reach" is just 2 or 3 people, it seems like a waste of my time. I am getting a lot more followers on Pinterest and Google+ so I am focusing my energies there.